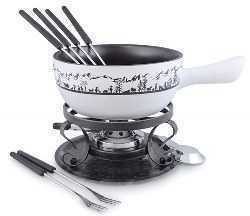 Alp Auf Zug fondue set including 6 black ABS cheese forks with a silver design. 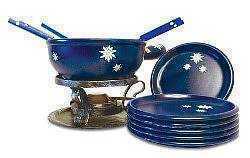 Paste fuel not included - order to purchase separately. 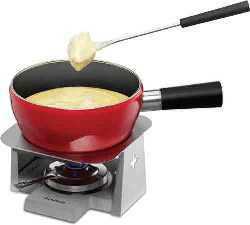 Note: Paste burners are used for a lower temperature heat; alcohol burners for higher heat. 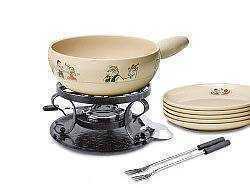 Biege ceramic pan with hand-painted drawings from the Heidi story. 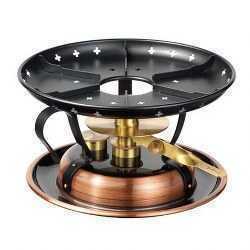 2.5 qt. capacity. Don't forget to buy the paste fuel, item F-1036, so you can enjoy right away! 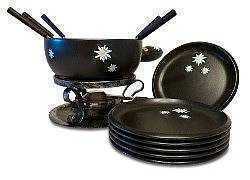 Set includes a black 2.5 qt. 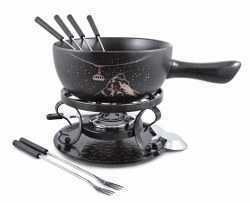 ceramic pan with a Matterhorn/Gondola, Matterhorn/Climber design, the Classic black wrought iron frame, paste burner, and 6 black plastic-handled cheese forks. 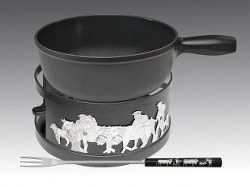 Black enameled 2.5 qt. 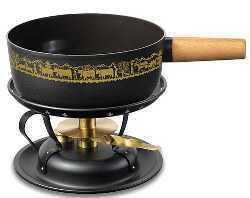 steel pan with light wood handle, a gold classic Alpaufzug design. 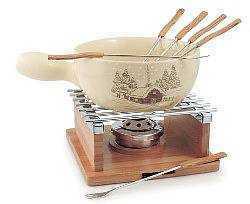 This pan can be used on induction burners.